James Hanratty was hanged for shooting two lovers on a deserted road. The guilty verdict was upheld by the Court Of Appeal, despite claims of police corruption. “I’m dying tomorrow. But I’m innocent. Clear my name.” James Hanratty speaking to his family on 3 April 1962 James and Mary Hanratty had their first son in 1936. Taking his father’s name, James was the oldest of four brothers. “...war seems to me to play an important role in his childhood, and in the development of the man he was to become. His father is in the army, so...is often absent from the home. And then in 1944, when London is being bombarded by doodlebugs, James, and his younger brother, Michael, are evacuated to Barrow in Furness in Cumberland.” David Wilson, Criminologist Hitler’s new flying bomb first hit London in June 1944. The intensification in the bombing campaign lead to a child exodus from London. James was just one of 800,000 child evacuees from Britain’s towns and cities. The fostering of these little refugees was often haphazard and occasionally callous: “James is in a large hall with his brother Michael and a couple come up. And they choose James without his brother. “They marked him down as retarded...his family refused to accept that diagnosis. They refused to send him to...what we’d now call a sort of special needs school. They sent him to an ordinary secondary school, where again he didn’t do well” John Eddleston, Author. He was not an unruly pupil, just a rather slow one. He was ‘well-mannered’ but lazy. James left school at 15 and began working with his father at Wembley Borough Council, sorting refuse. He hated it. A year later, in 1952, Hanratty had an accident. He fell off his bike and was unconscious for ten hours: “When he awakes from this accident, his behaviour is odd. For example he takes the family’s ration book with his younger brother, Michael, and goes and buys sweets, gives all of the sweets to Michael, and then disappears. He simply doesn’t turn up at home. His parents clearly are very worried about him, and they eventually discover him some four weeks later. He’s been living in Brighton. David Wilson James returned home to Wembley. But he didn’t return to the job he hated. Instead, now aged 18, he started thieving. He stole a motorbike. He was caught and given a conditional discharge. Having not even passed his driving test, he was banned from driving. This inauspicious start to his criminal career was a portent of things to come. Two months later, in November 1954, James had his National Service medical. He failed. He was classed Grade Three Unfit. He was illiterate. Being only marginally less of a failure as a criminal, James returned to his illegal activities. His petty thievery ranged from robbing houses to stealing cars. The latter meant he had to be able to drive off any type of a car at a moment’s notice. 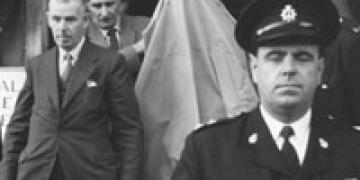 James’ criminal career earned him a living but also, in 1955, his first custodial sentence. Prison is often considered an occupational hazard for the professional criminal but James couldn’t cope inside. Soon after entering, he slashed his wrists. As with most things, he failed in his suicide attempt. He served two years in prison. In 1961, James, now 24, was released from Strangeways. The last seven years had been a revolving door of prisons. He vowed never to return. “...he started worked with my father. He got a window cleaning business going, and he thought that would please Jimmy...and Jimmy was over the moon – he was laughing, he had a tan; you know he was well into it. Then my father went on holiday with my other younger brothers...and he left Jimmy to run the window cleaning business...Jimmy got bored, and away he went.” Michael Hanratty, James’ brother Window cleaning in Wembley didn’t compare to the West End’s bright lights and glitz and glamour. It’s burgeoning bars and nightclubs welcomed criminals, like the Kray Twins, as they gave a certain frisson to their establishments. But whereas Ronnie had Reggie, James had Charles France. His partner in crime helped him fence stolen goods but, like James, Charles was no criminal mastermind.